How did you integrate technologies – software, hardware and online – in this product? What is your brand identity / missions statement? How does the design / content of your three products fulfil your audience’s uses and gratification? How do the products speak to the audience and try to create a relationship with them? What record label would suit your star the best? What marketing strategies would you use to create buzz around your album lunch? How would you reach your target audience? How are you likely to make your star profitable? We therefore created a vlog to answer all these questions in a relaxed atmosphere. Our CCR2 was how we created our sense of branding within our music video, digipack and website. We compiled a list of ways the elements of our production work has worked together to create a sense of the branding, through the colour schemes, styles and narrative of each of our three products. We then created a video essay, showing the music video, digipack and website while explaining our brand through a voiceover. When we were creating our web page we found it quite difficult as we never had a lesson on using Wix.com. This meant that we had to play around with different tools on the page. This took up quite a lot of time as we had to make sure we got our star image correct and made sure our fonts and colours went together well, and made sure they attracted our right target audience. Throughout the making of our webpage we used the add tool so we could keep adding different images and texts onto our webpage. Once we had found this tool, it was very easy to use it as we made a basic website and helped us know what we could put where and where we could place different aspects of the website. Overall these basic tools helped us to create our website, including different backgrounds, colour schemes, images and texts suitable to our star image and genre. This has helped us to be able to learn more about Wix and be able to make our webpage go with our star image and genre. During the creation of our digipak I have excelled in photoshop. This is because I have started using different filter tools to enhance my images to get them to the colour or shape that I wanted them to go to. I firstly used this on the motion photo to make the hairs of my models hair go blue, I did this using the photo filter tool which enhance the image to whatever colour you wanted to, in the image below I changed my models hair more pink. During the creation of our Digipak we also used the camera raw filter, this helped us to be able to change the levels of warmth or cool to the image we wanted to use. We used this when we were making our models eye turn electric blue and pink, this helps the pupil of her eye stand out more from the iris of her eye. This goes well if the genre of her music as it makes her stand out from the rest and goes with the RnB genre. Above is what her eye looked like after we had put a cooler tone on it, it makes it stand out more and look different from what everyone else looks like. As a group we also used the brush stroke tool affects, this didn’t come out as well as we wanted it to so we didn’t use them on the digipak but we still learnt how to use them more and also played around with them to understand the tool more. This mad the digipak look unprofessional and didn’t make our digipak look professional. We also used the colon tool to photoshop her neck to male it look less bulky as it looked to thick and harsh for the type of photo we wanted to produce, we also the blur tool on the back cover to sort out the little bits of whispy hair out that stood out too much and made her hair look messy. Above is how we used the brush stroke tool affect and how we applied it, but we ended up not using it. Once we had done and created our digipak mock up we then asked our fellow students what they thought our genre was and what adjectives described it the most. This has helped us to see whether we are achieving our aims and if we weren’t what we could do to improve these things. Here are the results above which display very clearly that the most popular genre was indie pop/R&B and also the favourite adjectives were aesthetic and sensual. This showed to us what we wanted to achieve and what we need to create for our target audience. This shows what are digipak was created for and it was easy for our peers to be able to pick out what the main genres and the main affects that we want it to have on them. This feedback from out peers has helped us be able to explore what colours, typefaces and images fit the best with our genre and artist. We collected this feedback by asking different age groups of our peers to put a tally by which adjectives and genres they thought it was, we gave them two tallies each. The adjectives we used in our feedback sheet encoded our digipak well and we thought our audience decoded our genre and artist well as they had a preferred reading on our digipak therefore our mock up digipak was successful. L.U.N.A’s fearless and energetic personality represents her explosive new music as it hits the charts. Focusing on her fans and moving on to their modern day manifestations, a rainbow of indie hip hop styles will be explored. With a target audience of 14 – 30 year olds, the young demographic will be exposed to her current chart topping indie pop/hip hop albums whilst new and upcoming indie artists following her work will have a platform to share their artistry and passion. Our music video, ‘Rather Be With You,’ by Sinead Harnett, we came up with the mission statement above this is so we could show our audience, what type of characteristics and ideas that our target audience most relates to and portray what type of elements that they will be able to pick out. Our mission statement is important because we want it to target the right audience for Luna. Our mission statement of L.U.N.A, is seen in both our music video and digipack. We need to make sure that our mission statement hits the target audience that we want to focus on, the mission statement needs to be able to entice our audience through our use of mise-en-scene and the genre of our music video, which is pop/R&B. This is to convey that Luna is a out there performer and has her own quirky but she is just like one of the members of the public too. Additionally, Luna’s music is a mixture between pop/R&B so she will get a range of different audience members.Similar artists to Luna would be the likes of Rihanna, Ariana Grande and Florence and the machine, as they are R&B/pop artists that are similar to her but they also have there own quirky side to themselves. The audience will be able to engage with Luna by the colour schemes, images and props, this will help us be able to get the right target audience that we want to reach out to. To find out our target audience we looked up our artist and genre on YouGov, this helped us to realise who we needs to enticed and reach out to for our audience, this is typically 12-25 year old females who enjoy the indie pop/R&B genres. Overall, Lenny has helped us develop our skills in these different type of technical skills and editing skills. In this first screenshot, we used colour correction to enhance the redness in this clip, this help to make the flower stand out more so that you can tell that flowers are a symbol throughout the music video. Lenny also showed us how to create a vignette around the outside of the frame. This makes it look like a flashback which is the idea we are going for so the audience realises that its one of her flashback/dreamy moments, it also makes the rose stand out more drawing the audiences attention towards the rose more so they audience can kind of guess the symbols of love and happiness. Additionally, Lenny also taught us how to do an echo on a clip. This makes a clip look more like a memory and a flashback for the audience watching the music video. We used these particular effects in our music video so that the audience can clearly see that the different clips are different flashbacks and memories for the two main characters rather then them thinking it is in real time. 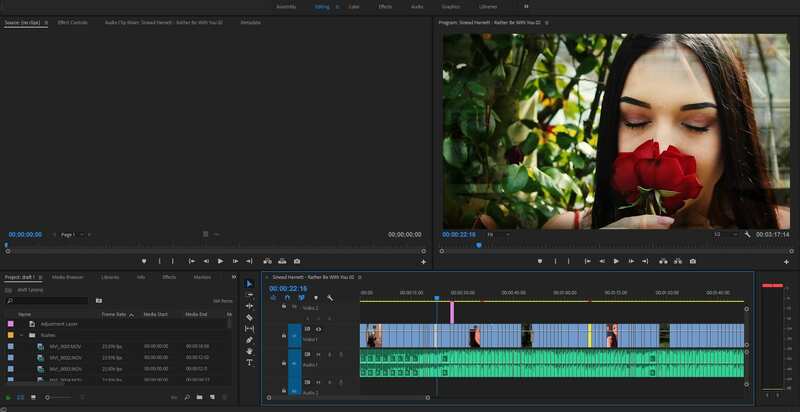 his helped me improve my technical skills and showed an improvement when I next went onto Premiere Pro. In this last screenshot, we were cutting this using a transitional effect where the videos go over one another, which helps the transition go smoothly. It portrays one of the main characters having an amazing time with her boyfriend, this shows the audience what is going on in the storyline of the music video. Overall, this has helped me gain more knowledge in the post production skills and design skills from the feedback and techniques we have learnt from Lenny. This has helped us improve our music video a lot more and it now looks more professional because of the new skills we have learnt and added into the music video. making sure you have enough footage for both the narrative and the performance, you can never have too much footage. make sure the music video makes sense and that your target audience will be able to follow the narrative. Overall, I have also got more knowledge in my design skills from feedback from my teacher, this is going to help me be able to develop our video as we keep filming and editing it together as a group. In this first screen shot I was trying to make the passing of the rose to the rhythm of the beat. This makes the continuity of the video better and also keeps the shot at a reasonable length to make the audience concentrate on it more. In this second screenshot I was trying to lip sync her lips to the lyrics of the music. This was to make sure that the video looked real and natural so that it looks professional enough to be a “real” music video.